The Virginian-Pilot is reporting that the Langley Federal Credit Union at 7420 Granby Street was robbed Friday, August 20, 2010 shortly after noon. The man received an unknown amount of money and fled, Amos said. Shortly afterward, a dye pack with the money exploded. The description of the man was vague. Police were looking at surveillance camera images to get a description of the man. Anyone with information can call Crime Line at 1-888-LOCK-U-UP (562-5887). Collins Enterprises LLC has not turned in information and documentation requested by the Planning Department and the Planning Commission. Therefore, their request has been continued and will NOT be heard on August 26. Updates will be forthcoming. Update: The Collins application has been continued indefinitely noting that they need time to work with the neighborhoods. Yard signs are now available so that you can let neighbors, City Council, and Mr Collins know that the current proposal for “The Landmark at Talbot Park” is unacceptable. Opposition to Collins Enterprises, LLC’s proposal to build apartments on Newport Ave, rather than condos as originally promised, is growing amongst the Wards Corner community. The four story proposal would change the nature and character of Newport Ave, the neighborhood, and the community as a whole. 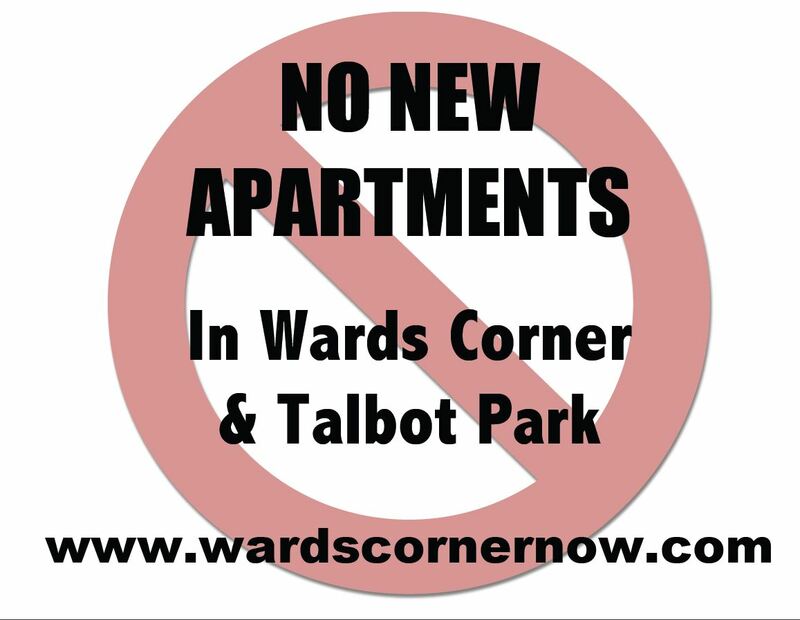 To get your very own yard sign, please email us at wardscornernow@wardscornernow.com . Be sure to send your address. Collins Enterprises, LLC is scheduled to go before the Planning Commission on August 26, 2010 at 2:30 p.m for their application to amend their site plan to build their proposed apartment building. The Landmark at Talbot Park, a four story apartment building with 189 units, is proposed to be built on Newport Ave just north of Granby Elementary. The property was rezoned in 2008 for a high density multi-family development which was promised to be condos. The developer’s recent quest to change the development to apartments has not been well received by residents of the neighborhoods surrounding the development. All interested residents and citizens are encouraged to attend and voice their opinion. 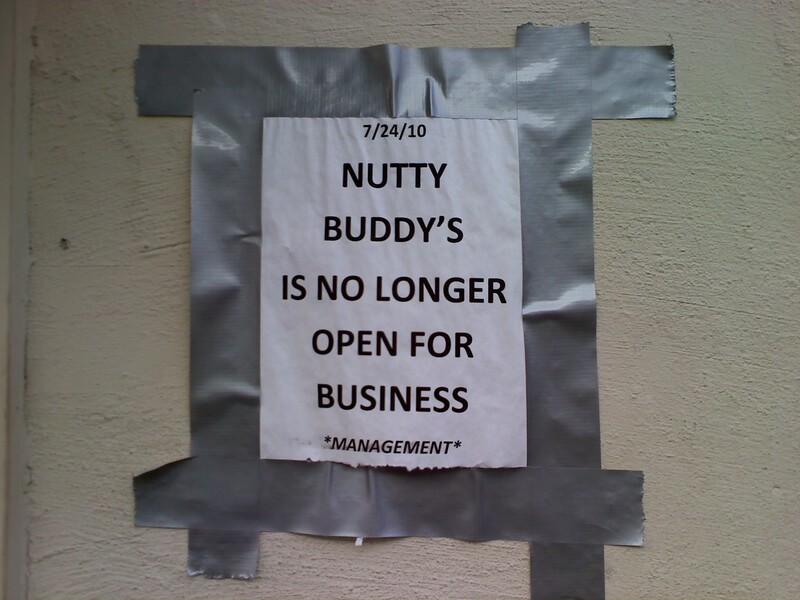 The problematic gay bar, Nutty Buddy’s, at Wards Corner has closed. The Nutty Buddy [sic] in Norfolk’s Ward’s Corner neighborhood has become a nightly source of criminal activity, which often spills-over into the streets of the working-class neighborhood. The club is now a gathering spot for the area’s black transvestite community. Drag queen shows or ‘pageants’ are regularly held at the Nutty Buddy, drawing hundreds of drunken celebrants. Excessive noise, public urination, and fighting are commonplace when the club is open. During 2008 alone, Norfolk Police records report no less than 50 assaults occurring within a one block radius of the club. In addition to the usual rowdy behavior seen outside many bars, prostitution has become a major problem for the neighborhood. On any night, scantily-clad transvestite prostitutes can be seen waiting for their next date in front of the closed sub shop next door to the club. Often, they ply their trade in parked cars in the parking lot, and throughout the surrounding neighborhood. Wards Corner Now had a meeting on July 17, 2010, at the Norfolk Fitness and Wellness Center. As is customary with WCN meetings, the facilitator of the meeting is rotated month-to-month and Martin Thomas, Jr., chaired this meeting. Topics covered were: the initial phase of the DePaul site master plan and the new Norfolk Collegiate arts center. In addition, short updates were made on the status of the following items: Denby Park, Talbot Hall, Walgreens, the proposed Collins Enterprises project and AJ Gators. Over forty-five area residents attended the meeting, including City Council members Barclay Winn and Andy Protogyrou. Below is a short summary, nothing is verbatim. Jim McDonnell introduced Roger Soto, president of the design group working on the development of the Bon Secours site. Mr. Soto indicated that a master plan is in its early stages of development but that there is an immediate need for the construction of a medical office building to house doctors’ practices and a comprehensive, freestanding cancer center which would be one of the first in the region. In the development of the master plan Bon Secours plans to engage with neighborhood groups in much the same way as they did in Richmond while planning for St. Francis Hospital. A master plan charrette occurring in approximately 2-3 months will be part of this process. The medical office building will be constructed in the current parking lot as close to the hospital and as far away from Ridgley Rd. as possible. Currently there are 2 openings on Ridgley which would be closed and everything would be oriented to Kingsley Lane. The edge bordering the neighborhood would be enhanced. There will be no visible mechanical plant and Mr. Soto indicated that the design company is working on a neighborhood-friendly solution to trash. The shape of the building is determined by the function of the cancer center and will include an entrance water feature and healing garden. The 4-story building has a step down on the Ridgley Road side with the intention of more easily integrating into the neighborhood. The cancer center will include a café, meeting rooms and chapel which will be open to the community when not in use. Councilman Andy Protogyrou introduced Scott Kennedy, headmaster of Norfolk Collegiate School. Mr. Kennedy reviewed the Norfolk Collegiate Board of Trustees’ commitment to remain connected to the community and to remain in their current space. As part of the ongoing strategic building plan, a fine arts complex will be built in the area of the medical building adjacent to the Granby Street property. The complex which will provide arts experience instructional areas for students much of which will also be available to the community. The vision for this space includes a 456-seat theater and secure galleries. Denby Park – The potential for Denby Park to become a baseball and athletic complex was brought forward again at the Wards Corner Task Force meeting. Talbot Hall – The Episcopal Diocese of Southern Virginia is putting together a task force which will seek input from neighbors and local parishioners and make recommendations to the diocesan Property Committee. The final recommendation committee recommendation date has been pushed back to the beginning of 2011. Walgreens – The hearing for an application to sell alcohol has been rescheduled for August. Collins Enterprises – No information has been received yet. We are waiting to hear from the developer. AJ Gators – The goal for opening the new location in the first part of August. Civic leagues will be notified of any special activities. Councilman Andy Protogyrou – With the goal of maintaining the focus on Wards Corner, Councilman Protogyrou has requested of the City Manager a meeting with all city departments for a report all activities related to the area and is eliciting questions for the departments. Beautification Concerns – A concern was raised regarding the condition of the crepe myrtles planted along the city easement on West Little Creek Road from Tapley Avenue east through Titustown. The Thole Street medians were also mentioned as an area which needed attention due to being unkempt. 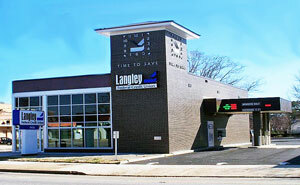 ATC Fitness – ATC Fitness is moving to the northwest corner of Wards Corner. You are currently browsing the Wards Corner Now - Wards Corner, Norfolk, Virginia blog archives for August, 2010.